Banana & Cranberry Nut Muffins - no flour, no added sugar. These muffins are really good - naturally with no flour, they are a little more dense than regular muffins, but very filling. I use frozen bananas because, once defrosted, they are already the correct consistency and require no mashing. I keep bananas in my freezer all the time - once defrosted, cut one end with a sharp knife and you can squeeze the flesh out like a tube of toothpaste. 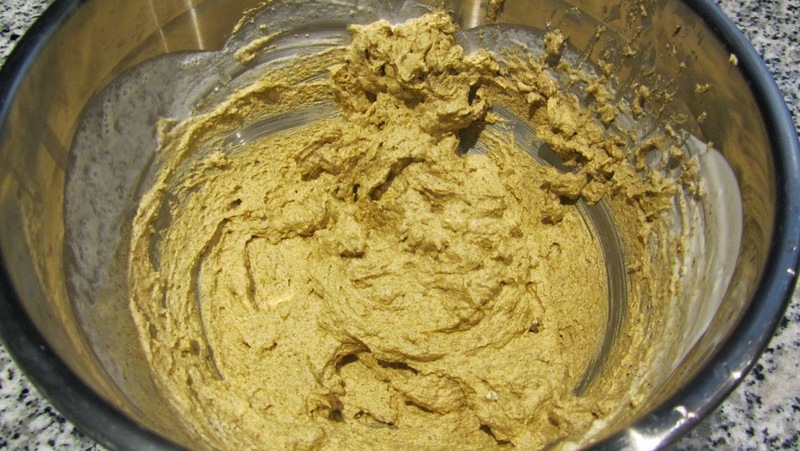 If you don't have frozen bananas then by all means use fresh but they will take a lot of mashing - a blender would probably be the best solution. fill the muffin cups evenly and top each muffin with half a pecan or other nut - bake for 30 minutes. These muffins freeze well, and are best served warm - defrost and warm in a microwave for 15 seconds. Serve by itself, or as a side with just about anything you can think of. This recipe can be adjusted to fit individual tastes. Any single bean or legume can be used, such as Pinto, Kidney, Lima, Mung, Split Pea. Or make your own mixture. For the purposes of this recipe I used a 15-16 dried bean medley available in the “Bean” aisle of HEB, our local grocery store. It is a combination of various beans. 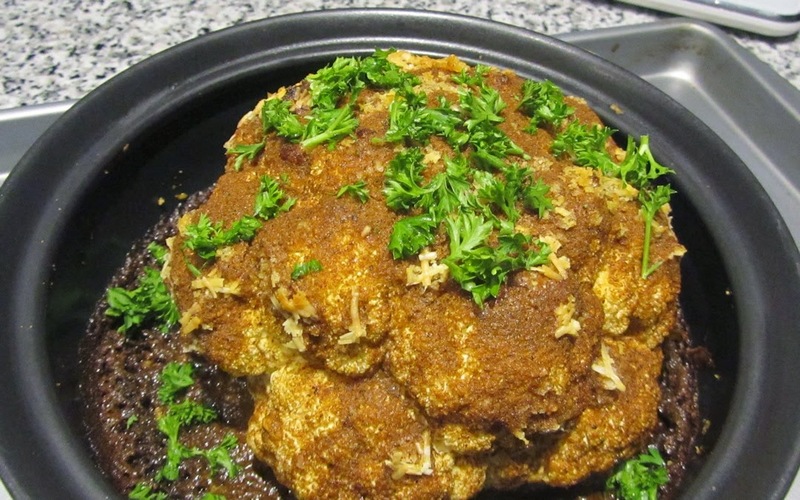 Feeds 8-12 and ready in 8 hours by crock pot (high) or 6 hours stove top. Measurements are not precise and should be adjusted to taste. Start with smaller quantities as you can always add more. You will need a 4-8 quart pot to prepare this in. I used a 4 quart crock pot which was almost to small. 1 teaspoon lime, lemon or apple cider vinegar if you want to cut back the sweet. Wash beans with cold water and cover with 2-3 inches of water. They need to soak overnight (8-12 hours). I do this in the container I am cooking them in. I use the water they soaked in but some prefer to discard that and replace with fresh water. If using meat, brown in a skillet. The size of the meat cubes depends upon taste. I like smaller pieces others may prefer larger pieces. You do not need to fully cook the beef, just get the outside brown to seal. You can substitute any meat or leave it out altogether. One of our favorites is to use cooked brisket from Smoky BBQ house in Leander. It saves the time and mess of browning. The same goes for cooked ham, smoked ham hocks etc.. 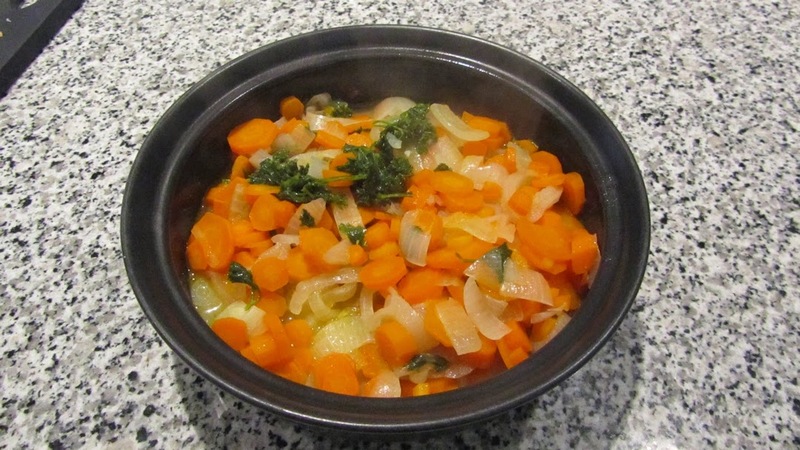 Combine all of your ingredients into the pot and cover with water. I usually start with water and add beer as it cooks. The more water you use the soupier it will be. ½ to 1 inch covered cooking is my preference. If you put too much water you can boil it off. Bring to a rapid boil if on the stove top and then high simmer (very low boil) till beans are soft (4-6 hours on stove top). 1-2 hours into the cooking remove any floating grease from the pot with a spoon). Stir frequently. If using a crock pot put on high for 8 hours. 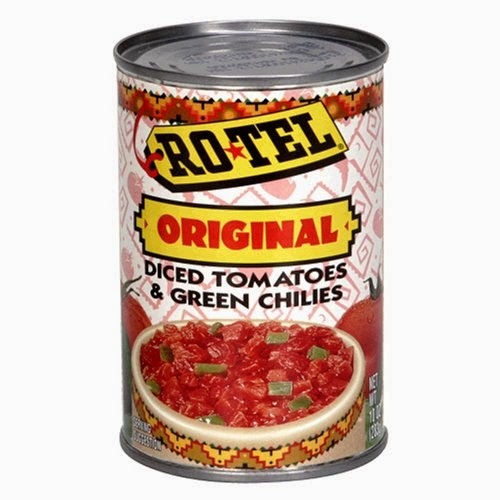 Serve with a side of chopped raw sweet onions and fresh or pickled jalapenos for a crunch and extra kick. 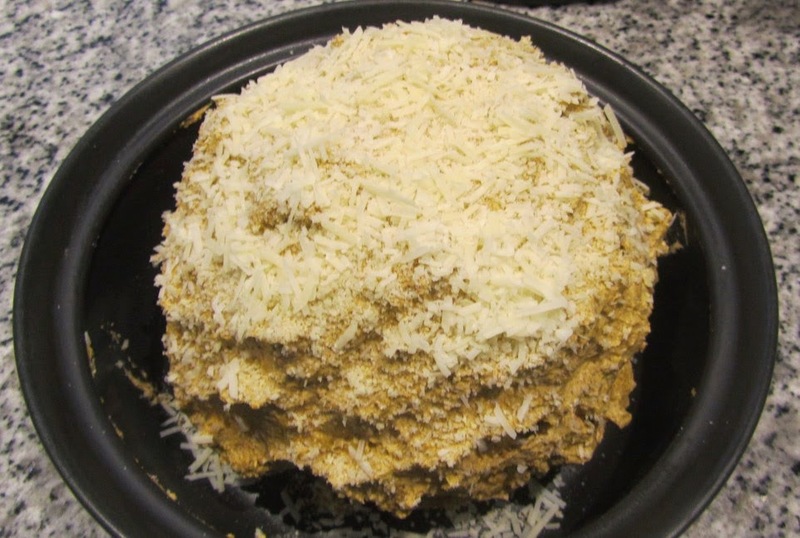 This recipe is absolutely the best the next day, in fact I recommend making it the day before and let stand overnight in the refrigerator. It refrigerates and freezes well. 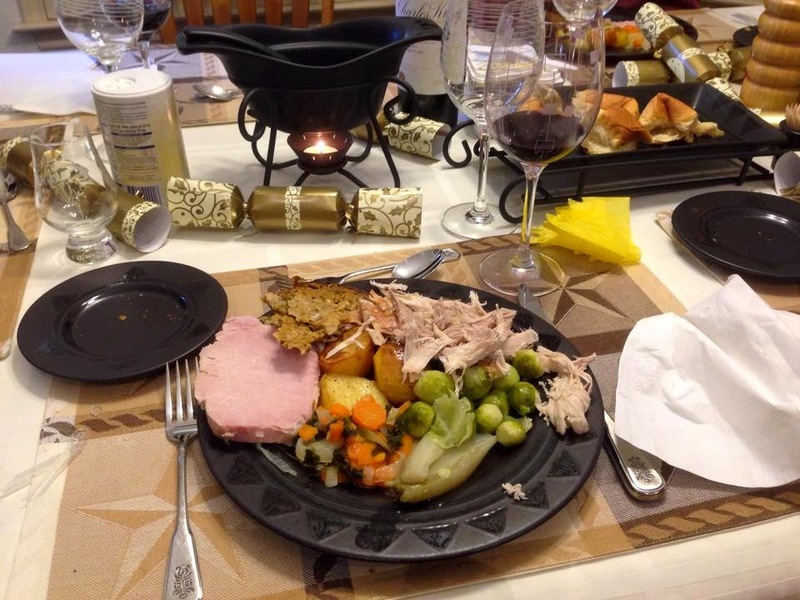 For some time now my son has been asking me to document my Christmas dinner, so this year I decided to do that. My Christmas dinner evolved, starting with dinner at Granny's house. ( See Chapter 1 of Peeling The Onion for a full description of what that was like). I never knew how the food was cooked as my grandmother hired a cook for that and besides I was too young to care, but later on, when Christmas at Granny's stopped and my mother took over, I learnt a lot helping her. Over the years I have put my own slant on how I prepare and cook, and even what I prepare and cook. I do always have the traditional Irish boiling bacon and roast, stuffed turkey. Now that I am living in Texas I order my bacon well in advance from Food Ireland and it arrives frozen, there is a lot of ham here, but that is not the same. I also order Irish rashers for breakfast on Christmas morning. We have a traditional 'fry up' on Christmas morning, less traditional is the fact that we use paper plates and plastic knives and forks for breakfast - anything to minimize the cleanup is a good idea. A very important part of the preparation is to soak the bacon in cold water for about 2 days before Christmas, this water is changed at least once every 24 hours, more is better. This minimizes the salt content. Traditionally in Ireland we had plum pudding & brandy sauce for dessert, but I no longer do that because almost no one I currently feed likes it and it is a huge amount of time to prepare and cook. This year we have a choice of either apple pie or berry pie with ice cream and / or whipped cream. I like to finish off with an Irish coffee. So, how do I prepare and cook all of this? Well, a tradition my mother started was to prepare as much as possible on Christmas Eve, minimizing the work to be done on Christmas Day. What can we do the day before? Remember at least two days before we started soaking the bacon and changing the water regularly. Everything can be cooked on Christmas Day, but the more you can prepare the day before, the more time you have to play those boardgames Santa brought the kids, or table tennis, or trains.. or Super Flight Deck and Barbie Dolls and Stretch Armstrong. 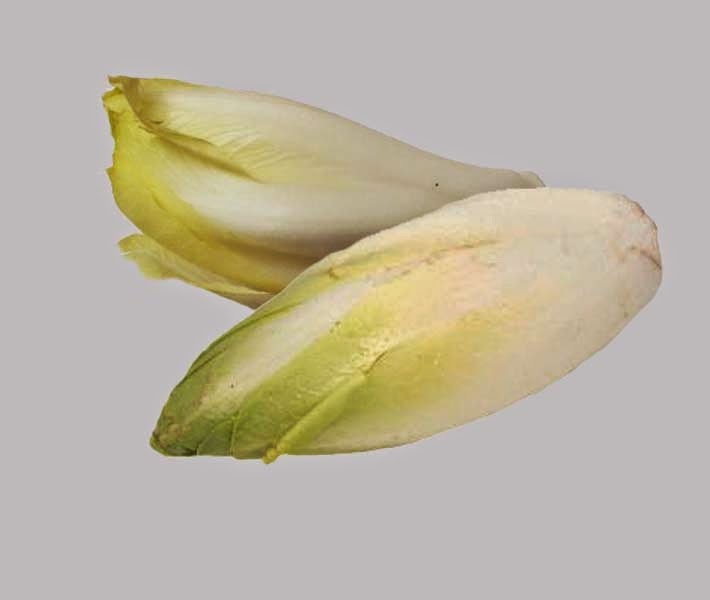 Also known as Belgian Endive, is not easy to get in Texas so I keep an eye out for it coming up to Christmas and as soon as I see some I buy it and cook and freeze it. Naturally it is better if it is freshly cooked, but it does OK being frozen and that is better than none at all. Chicory is an acquired taste - it is the dandelion family along with Radicchio, so I am sure you can imagine, it is bitter. Braising it in butter reduces much of the bitterness however. To prepare it, cut the end of the stalk off, remove any damaged outer leaves, slice from stalk to tip into quarters and wash. Then melt butter over a gentle heat, more is better - but how much depends on how much Chicory you managed to get and how much you like butter. Toss the chicory in the melted butter over the heat add a pinch of salt and a small amount of water, cover and simmer for about 10 to 15 minutes stirring occasionally. 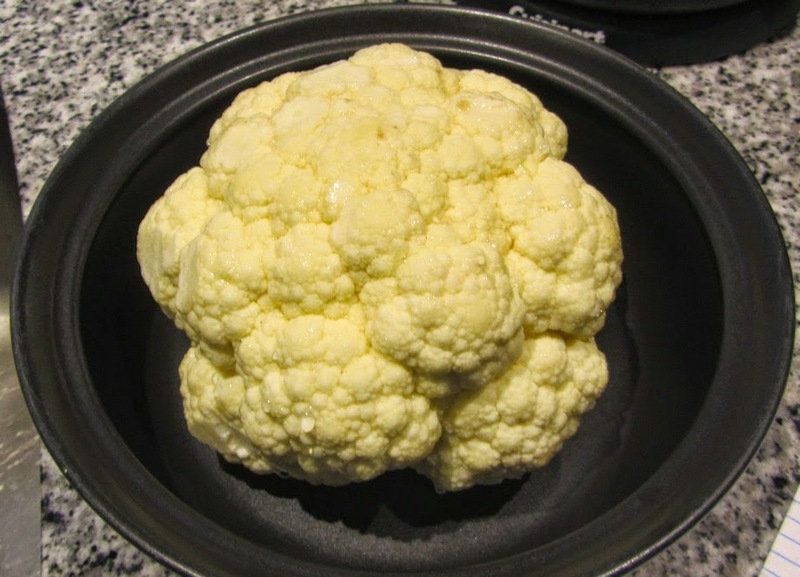 If you were lucky enough to get this just before Christmas, then cook it on Christmas Eve and it will heat up nicely the next day in the microwave. Otherwise freeze it and heat up in the microwave from frozen. 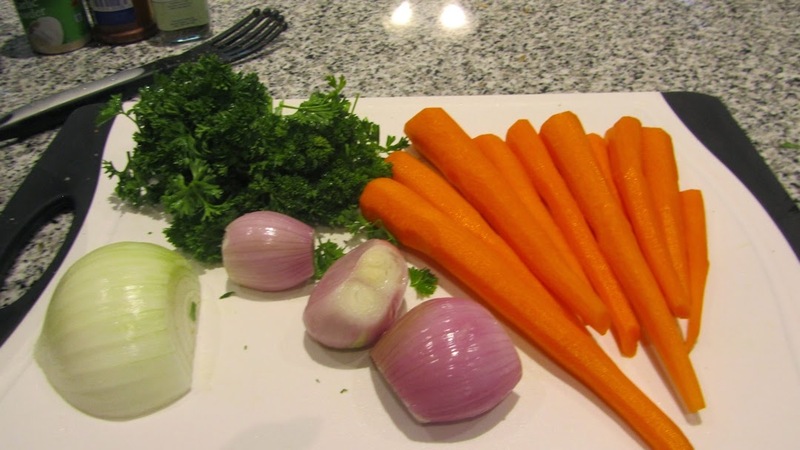 I used a little over half a pound of carrots - I always buy organic when I can get them - half an onion, three shallots (optional) and half a bunch of parsley. When my kids were growing up I used to make my own chicken broth. We normally had a roast chicken on Sunday, so coming up to Christmas I would boil the carcass in a little water and strain and freeze the broth. Nowadays I just use packaged broth. 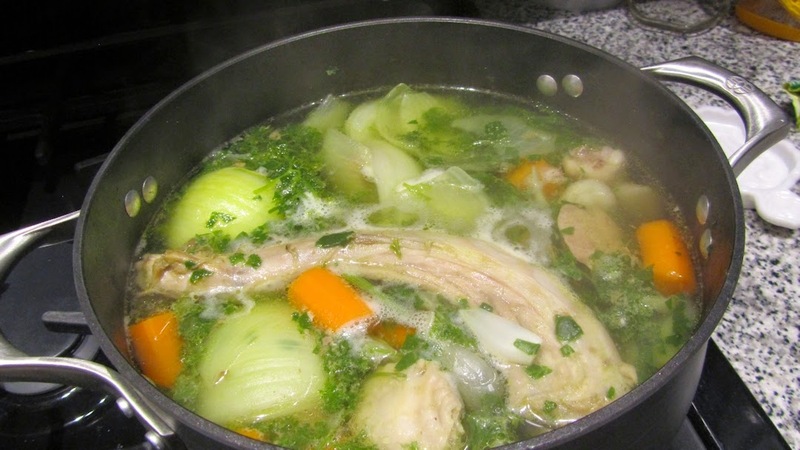 Place the giblets, neck, wing tips, peeled and chopped carrots and onions in a pot with chicken broth and chopped parsley and spinach if using. Add salt and pepper and bring to a boil, turn down and simmer for about an hour. Let cool and store in the refrigerator. I use french bread for this, and how much depends on how big your turkey is. For a 10 pound turkey I used a full loaf. Normally I buy the bread about 3 days before Christmas and leave it out to slightly harden. 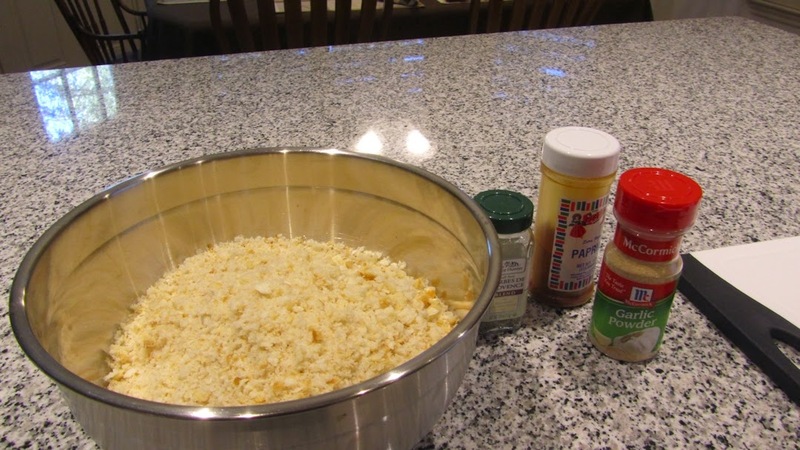 Then I chop it into chunks and put it in my food processor, in no time I have breadcrumbs. It may look like a whole lot, but they will shrink down. Breadcrumbs - these have got to be fresh not those awful things sold in packages for deep frying! 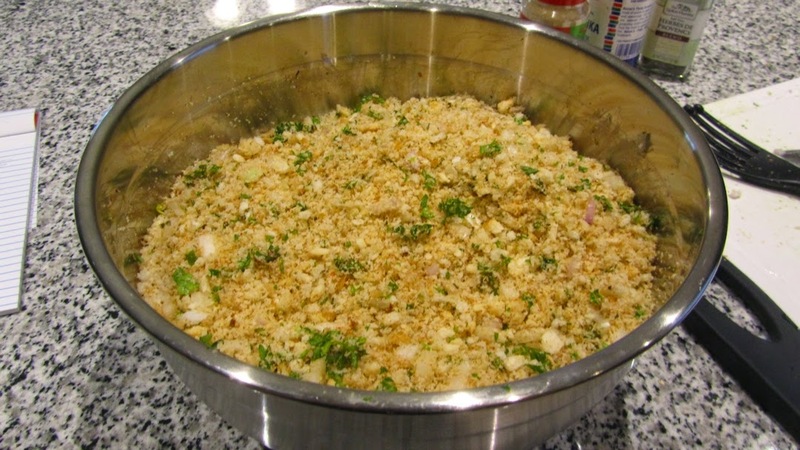 mix the garlic powder, paprika, salt and pepper with the breadcrumbs, add the onion, shallot and parsley and mix well then.... and here I have to mention that a critical piece of equipment in my kitchen has always been surgical gloves. 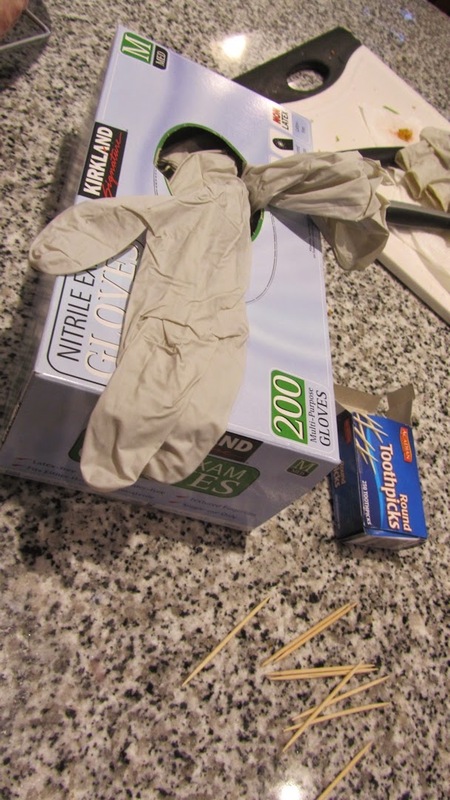 I use them for any task that is messy and in particular for handling foul... so then don your surgical gloves (these you will throw away after each use) add 4 beaten eggs and using your surgically gloved hands mix well. Sit your turkey in a pan because you are going to stuff the neck. don't stuff the body of the turkey, there are a number of schools of thought on this, some say it is dangerous to stuff the body. The juices from the uncooked turkey.. OK the blood ... drips into the stuffing in the body of the turkey and may or may not get fully cooked. Also, I like to be able to slice the stuffing rather than spoon it out of the body cavity. So, sit your turkey comfortably in a pan. You may need to trim some fat from inside the neck but be careful not to pierce the skin. I found the easiest way to stuff the turkey is to make balls of the stuffing and wad them down into the neck cavity. When it is finally completely full, use wooden tooth picks to hold the skin in place while cooking. My mother used to use a large darning needle and thread, but it was so hard to find the thread to remove it after cooking that I found toothpicks to be a much easier way to do this. 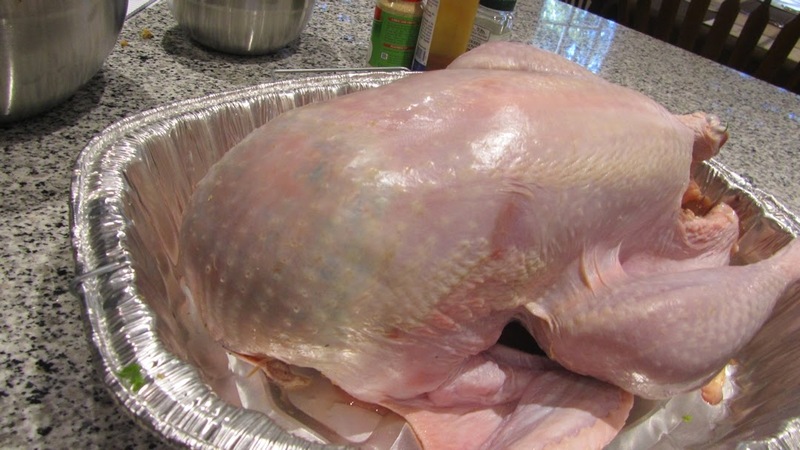 Place the cleaned, stuffed turkey in a turkey bag and put it in the refrigerator. By now the refrigerator is getting pretty well stuffed. Both the potatoes and the sprouts can be cleaned and prepared the day before, but should not be cooked in advance. If preparing them the day before, then place in a covered container in cold water overnight. It isn't necessary to put them in the already stuffed refrigerator, though it is preferable. They can stand on the stove overnight in cold water - covered of course. Peel, wash and par boil them - for about 15 minutes, until almost done, strain and they are ready to place in the oven about 30 minutes before dinner. Make that 40 minutes if you like them crispy, which my husband does. Back in the days before oven bags for cooking a turkey, we placed the potatoes around the turkey to cook, however they will get crispier if they are in a tray on their own, so I usually add a mixture of butter and oil to a baking tray and place the par boiled potatoes in this to cook. A 10 pound turkey takes about 4 hours to cook at 325 degrees, roasting potatoes really requires a much hotter over, more like 425 degrees, so I normally add the potatoes about 10 minutes before the turkey is ready, 10 minutes later I take the turkey out and turn the oven up to 450 degrees. The potatoes will cook while the turkey rests. Prepare the sprouts by removing any damaged outer leaves, trip the stalk and cut an X into the stalk - this ensures a more even cooking of leaves and stalk. Change the water one more time on the bacon and bring to the boil. Ideally you want to boil the bacon for 30 minutes per pound, adding the sprouts to the water approximately 30 minutes before cooking finishes. My piece of bacon is almost 4 pounds so it will take two hours to cook. I used to bake pies from scratch, now I buy them frozen - they are perfectly fine and there is really no need to show off after the dinner I just prepared. I have found it helps to set out a timetable of when to do what, particularly on Christmas Day, in order to 1. Not forget anything and 2. Have it all ready at the same time. The Christmas Crackers are also from Food Ireland. Finally! an Irish coffee for the chef (and anyone else) with the remainder of the cream.